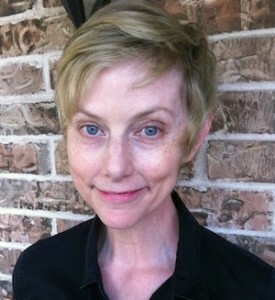 This month we welcome Austin SCBWI member Katherine Catmull to our interview series. 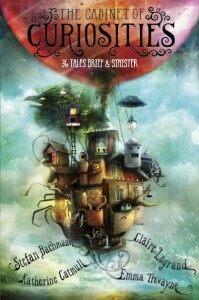 Katherine is a wonderfully talented writer who deeply immerses her readers in fantastical worlds. 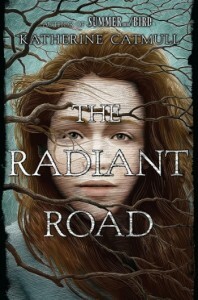 It is an honor and a pleasure to peek into her past, to a girl who lived in a forest-world and a book-world, and grew up to write books about girls going deep in the woods. I grew up all over—we moved a lot, so my five younger brothers and sisters, especially my brother closest in age to me, were in some ways my main cohort. I was born in Salt Lake City and lived there till I was five and a half—after that we often went back to visit family. Whenever I’m in mountains and fir trees, it feels like home, and I’ve never written a book that didn’t have girls going deep in the woods. We then lived in Houston for 18 months, where the flatness and humid heat were a shock to my system, and I hid in book-worlds. Then we moved to Atlanta for four years — our first house there backed on to a mixed forest of hardwoods and pines, and the backyard had petal-showering pink and white dogwoods, and it was back to the glory of girl-in-woods making up mysteries to follow. But we also lived in Florida for a couple of years, and I went to high school north of Houston, both landscapes that felt too bright and hot to me: so back to the books. My childhood bounced around between forest-worlds and book-worlds, and both shaped my writing. Wanted to be (and was!) one as a kid, but put that away as a silly dream once I got to college, and even more so grad school. There writing, really any sort of creative work, seemed unserious and dilettantish. Like, ask yourself: Am I Virginia Woolf? No? Then put that pen down and stop being an idiot. I don’t remember anyone saying that to me, so maybe it was just my own (substantial) pretentiousness, but somehow that was the message I got. As a result, I returned to writing quite late — I wrote my first finished piece, a short play, when I was 43. Ha! They would be extremely bored. Plenty of days I don’t even leave my house. But ideally, let’s say—a slow start with coffee and toast and reading and cat-feeding. Then writing for a couple of hours at least, or more if I’m on deadline. Then freelance editing and coaching work, often well into the evening—unless I’m rehearsing or performing in a play, in which case a few hours goes to that. At night, if I’m not seeing a play, I just relax with my husband, a glass of wine, and Netflix or whatever’s on the DVR. I’m not sure it does right now. I’m rather new to freelancing so I haven’t yet found that balance between “uh wow I have no clients or money: time to PANIC” and “I am at this 100 hours a week and am still drowning in work.” That kind of insecurity isn’t really useful for writing. But I’m getting better at it—especially getting better at incorporating yoga and walks and photography and other practices that slow me down. At first I was surprised that it wasn’t quite as romantic as I’d imagined, more a lot of hard and frustrating work. Now that I’m more used to the hard, frustrating work, I’m surprised and happy to see the romance sneaking back in. I’m pretty lucky. I hope they’ll find a story that rings some bell in their hearts, I guess. That would be best of all. And maybe inspiration to be a little braver. 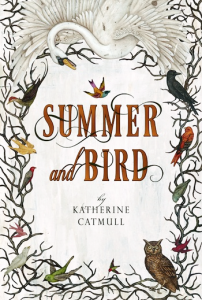 Bio: Katherine Catmull is the author of Summer and Bird, one of Booklist's 2012 Top Ten First Novels for Youth, and the YA fantasy The Radiant Road, which received starred reviews from Publishers Weekly and School Library Journal in 2016. She is also one of four co-authors of The Cabinet of Curiosities, named one of the New York Public Library’s 100 Best Children’s Books of 2014. Her short play “Right Into the Night Sky” was nominated as Outstanding Original Script in Austin’s 2016 B. Iden Payne theater awards. Her text-message piece Sister of Shattering Glass, commissioned by Physical Plant Theatre, will premiere in February 2017. Catmull is also a stage and voice actor, a freelance editor and arts writer, and a produced and published playwright.